Anubis Ransomware is a dangerous computer infection that will try to push you into spending your money on a decryption key. At the moment, security experts say that there is no way to restore the files affected by this infection. However, that does not mean you should give up deleting Anubis Ransomware from your computer. It is important that you get rid of all the malicious threats and then restore your files because by giving up you would allow these criminals to continue their criminal practice. If you think you cannot do this on your own, you can always invest in a licensed antispyware tool that will do the job for you. Our research shows that Anubis ransomware is based on the EDA2 open source ransomware. It means that there might be several other applications that are based on the same engine. However, it does not mean that you can apply the same removal or decryption principle to all the programs based on the same open source. The problem is that, once cyber criminals have a “skeleton” for their ransomware, they can modify it the way they want. Even ransomware-as-a-service infections may differ once they get customized. Thus, the origins of this infection can tell us more about how it works, rather than its potential removal method. We are still not sure how the program spreads around the net, but our research team suggests that the most common method for ransomware distribution is spam email campaigns. Thus, you may get an email message that distributes this ransomware when you expect it the least. Here you might say that all of the junk email messages get filtered into the Junk Mail folder, but when it comes to spam mail that distributes ransomware, the result might be slightly different. The spam email message in question could get into your main inbox, too. What’s more, sometimes those spam messages look like they have been sent out by a financial institution, and if you are waiting for some invoice from your bank or an online shop, you may think this is it. 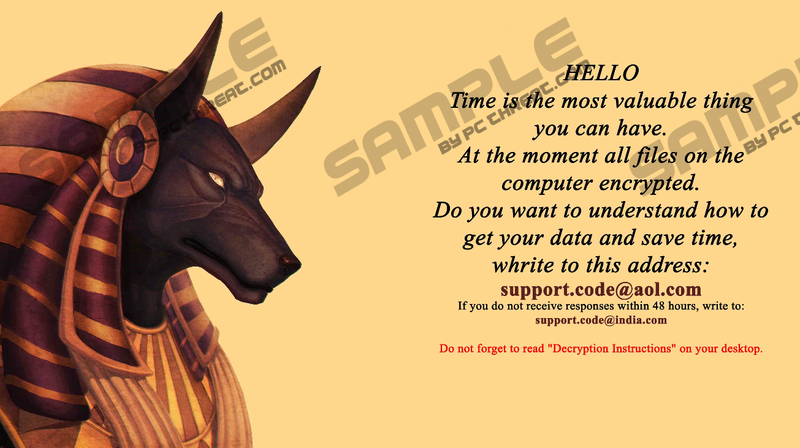 Unfortunately, the moment you open the attachment delivered by the spam message, you will infect your computer with Anubis Ransomware. The moment the infection takes place; this program scans your computer and starts encrypting your files. Encryption refers to the process when all the bytes that make your files basically get “scrambled” and then they are put together in a random fashion. As a result, your system can no longer read your files. Anubis Ransomware does not encrypt every single file on your system. It skips critical Windows system files and the browser executable files. The ransomware needs your browser to work, so that you could access the Internet and transfer the ransom payment. The infection expects you to contact the criminals via the support.code@aol.com address. After that, you should get a response within 48 hours, and the criminals will tell you what to do next. It is very likely that they will try to convince to purchase the decryption key that would restore all of your files. This decryption key will be expensive, and there is also no guarantee that the criminals would transfer the key once you have paid. Therefore, you should not resort to this solution. You can actually remove Anubis Ransomware from the system and then restore your files from an external backup. The external backup might by a hard drive where you keep copies of your files. Also, you may have copies of your files saved on some cloud storage. What’s more, quite a few users have a lot of files stored in their email inbox; it is just that they are not aware of that. Please weigh all of your options, and do not even consider paying the ransom fee. Once you have determined the way to restore your files, please follow the instructions below to remove Anubis Ransomware for good. The manual removal is far from complicated, but we would strongly suggest scanning your PC with the SpyHunter free scanner after that. There could be many other unwanted applications hiding in your system, so you need to make sure your PC is safe and clean. Delete the Decryption Instructions file. Quick & tested solution for Anubis Ransomware removal.